The Canon City & Royal Gorge has acquired a fourth ex-Holland America dome car from Alaska - HALX 553, Kashwitna. The full length dome car was built as Santa Fe 553 by Budd, and has also been Auto Train 515 and Susquehanna 502 according to the North East Rails Budd & Pullman Full Dome page. 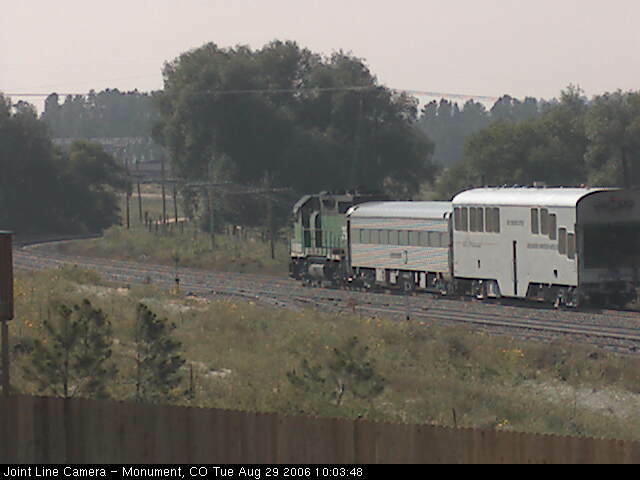 As of this morning, Saturday, 12-Aug-2006, the car was in Pueblo awaiting delivery to the CC&RG. Interchange is supposed to happen on Monday, with a special train moving it back to Canon City. Nathan Zachman caught the car in Pueblo, and you can see his photos [here] and [here]. In other CC&RG news, NZ also mentioned that they're getting ex-Alaska Railroad F7B 1503. The unit is currently on a barge on the way down from Alaska. John Combs' excellent [Alaskarails.org] site has photos taken by Mark Earnest of the unit's final journey in Alaska - to the barge slip at Whittier. The other bit of passenger train news from southern Colorado is the long-anticipated arrival of an EMD F unit for the San Luis & Rio Grande's passenger operations. Railfan & Railroad reported several months back that the SL&RG was supposed to get two FP10s - 1100 and 1114. (An FP10 is an F unit, usually an F3A of GM&O heritage, that was extensively rebuilt by ICG in 1979 for commuter service with the Massachusetts Bay Transit Authority, MBTA.) Today, the first of those two was spotted in Pueblo, again by Nathan Zachman. I've added his photos of it in the UP yard to [this page]. The Joint Line camera has been upgraded from an old D-Link DCS-2000 to a nearly new Axis 210. The most immediate benefit is a much better picture with a 640x480 image, rather than the old 320x240. You'll no longer need to guess at exactly what kind of unit is represented by the blob in the image. I was hoping you'd be able to read numbers on the new camera, but alas, it's just not that good. Exceptionally bad luck has descended upon the Georgetown Loop in the last few days. Yesterday, their Hawaiian 2-6-0, #12, suffered a broken driver axle on the conductor's side, right between the frame/bearing and the wheel. Thankfully, no one was injured and I'm told that there was no serious damage to the locomotive, beyond the axle and minor side-rod damage. 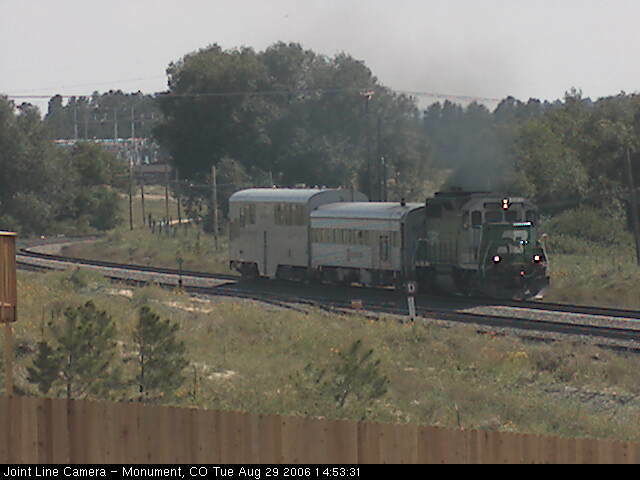 Also, their other steamer - #9, the newly (and beautifully) restored ex-C&S 2-6-0 - is apparently experiencing a few teething pains and is also out of service in the Silver Plume shops. Matt & Wayne Darling were on their way back west yesterday when they noticed something was amiss. They stopped, inquired, and learned of #12's broken axle, as well as of #9 having suffered a few broken staybolts. They sent a few photos of #9, as well as the rescue effort by GLR diesel #21 get #12 moving up the hill towards the shops. Eventually, apparently after they left, the crews got 12 moving, only to have the diesel derail in one of the cuts. Based on a post on NGDF, it sounds they did manage to get the two up to Silver Plume, and repairs will start immediately. Photos from Matt and Wayne can be found [here]. Steve Torrico of Railstar, the company now operating the Loop under contract from the CHS, has posted photos of the axle break in threads on both The Goat and the Narrow Gauge Discussion Forum. I wish the Railstar crews the best in getting both locomotives back to work. They've worked unbelievably hard to make a go of a very difficult situation over the past two years, and have done a remarkable job of it. Here's to hoping you're running again soon! As a reminder, the Durango & Silverton's annual Railfest activities begin in a little over two weeks. Goose 5 will be making trips again this year, and we'll again see a special photo mixed. A complete list of events, as well as prices and other information, can be found on the D&S's website [here]. Two weeks ago, I headed out to drive the Rio Grande's old grade over Marshall Pass. It's not very far, and by a little after noon, I was already on the west side in Sargents. So, I figured I'd got check out the route that Marshall Pass was intended to compete with - the Denver, South Park & Pacific's Alpine Tunnel. The Alpine Tunnel was the first tunnel under the Continental Divide, and having been built through unstable ground at 11,600 ft, was plagued with problems its whole short life. Put into service in 1881, it only survived for 29 years before the last train went through in 1910. Even a good portion of those 29 years were spent shut down due to either weather or economic conditions.